In March of this year, the Administration announced global tariffs on imports that it found to threaten U.S. national security – a 25 percent tariff on steel and a 10 percent tariff on aluminum. The product exclusion process was recently extended to imports from the quota countries. The Administration hasn't granted any requests for exclusion from the Section 301 tariffs on imports from China. Product exclusions may be requested by U.S. stakeholders on a rolling basis. There have been several important developments in regard to (1) U.S. use of Section 301 of the Trade Act of 1974 to restrict imports of various products from China and (2) U.S. imposition of global trade restrictions on steel and aluminum imports pursuant to Section 232 of the Trade Expansion Act of 1962. The Trump Administration asserts that the former are justified as a result of unfair intellectual property policies and practices maintained by China and that the latter are necessary to prevent emerging threats to U.S. national security. As summarized below, the conflict between the United States and China continues to intensify, but there are signs that the Administration is looking to de-escalate the global conflict over steel and aluminum. 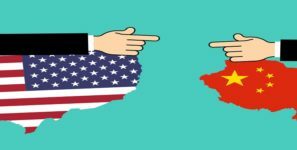 On June 15, the Office of the U.S. Trade Representative (“USTR”) issued two lists of Chinese goods that would be subject to a 25 percent tariff surcharge as a result of its Section 301 investigation. The first list covered approximately $34 billion in goods and was comprised of machinery and mechanical appliances; electrical equipment; vehicles, aircraft, vessels, associated transport equipment, and parts thereof; and measuring, checking, precision, medical or surgical instruments. The second list covered approximately $16 billion in goods and was comprised of lubricants; plastics; machinery and mechanical appliances; electrical equipment; locomotives, vehicles, and parts thereof; and measuring instruments. The duties for the goods on the first list were imposed starting July 6, while those for the goods on the second list were imposed starting August 23. Shortly after USTR’s June 15 announcement, China announced its intention to retaliate against the United States by imposing a 25 percent tariff surcharge on certain U.S. goods being imported into China. China issued two lists of targeted goods, with the first list covering agricultural products, cars, and aquatic products, and the second list covering mineral fuels, chemical products, and medical machinery. The duties for the goods on those lists were imposed starting July 6 and August 23, respectively. President Trump responded to China’s retaliatory measures by ordering USTR to develop an additional list of $200 billion worth of imports from China to be subject to a 10 percent tariff surcharge. Shortly after that announcement, China promised to fight back with “qualitative” and “quantitative” measures. On August 3, China announced new duties in the range of 5-10 percent on imports from the United States valued at $60 billion, and those duties were imposed starting September 24. On September 18, USTR issued its third list of Section 301 tariffs, covering approximately $200 billion worth of imports from China, dwarfing the value of imports covered by the first and second lists. The products targeted are subject to an additional tariff of 10 percent, effective September 24, which increases to 25 percent starting January 1. The list contains 5745 tariff lines, covering a wide range of products, including live animals and animal products; vegetable products; prepared foodstuffs; mineral products; chemical products; plastics and rubbers; rawhides, skins, and articles thereof; wood and articles of wood; paper; textile articles; headgear; articles of stone, ceramic, and glass; pearls; base metals and articles thereof; mechanical and electrical equipment; vehicle parts; photographic and cinematographic equipment; and miscellaneous manufactured articles. On October 12, U.S. Customs and Border Protection (“CBP”) confirmed that imports from China that qualify for reduced or suspended duties under the recently signed Miscellaneous Tariff Bill will still face the specified Section 301 tariffs. USTR has established a process by which U.S. stakeholders (such as purchasers or importers) may request the exclusion of particular products from Section 301 tariffs covered by the first two tranches. Notably, the notice for the third list did not indicate that there would be an exclusion process. The deadline for requests regarding the first list lapsed on October 9, but the deadline for the second list is December 18. USTR prefers electronic submissions made through the Federal eRulemarking Portal: www.regulations.gov. Exclusion requests should include certain information, including the following: the applicable 10-digit subheading of the HTSUS; physical characteristics that distinguish the proposed excluded product from other products within the covered 8-digit subheading; the ability of CBP to administer the exclusion; the annual quantity and value of the Chinese-origin product that the requester has purchased in each of the last three years; and the percentage of total gross sales in 2017 accounted for by sales of the Chinese origin product. In March of this year, the Administration announced global tariffs on imports that it found to threaten U.S. national security – a 25 percent tariff on steel and a 10 percent tariff on aluminum. Several countries negotiated their own deals to avoid the tariffs. Australia is exempt entirely but is likely to be monitored for import surges. Argentina, Brazil, and South Korea are subject to quotas (not tariffs) on steel. Argentina has a quota for aluminum, but Brazil and South Korea did not reach a similar agreement and therefore are subject to the tariff on aluminum without any quantitative restriction. The original, global Section 232 actions can be adjusted on a country-by-country basis. For example, in August, the tariff for imports of steel from Turkey was increased to 50 percent in response to the depreciation of the Turkish lira – the concern there was that the depreciation of the lira had made imports of Turkish products less costly and thereby undermined the effectiveness of the original Section 232 tariffs. Canada and Mexico are reportedly negotiating for quotas to replace the Section 232 tariffs as early as this November. And the Administration recently notified Congress of its intent to negotiate trade agreements with Japan and the European Union, which could involve quotas to replace Section 232 tariffs. The product exclusion process has been a key focus since imposition of the Section 232 measures. Product exclusions may be requested by U.S. stakeholders on a rolling basis. According to the Commerce Department, a product exclusion will be granted if the article is not produced in the United States in a sufficient and reasonably available amount or at a satisfactory level of quality, or if there is a specific national security consideration warranting exclusion. The product exclusion process was recently extended to imports from the quota countries. The Administration has made some important changes to the product exclusion process since it was established. First, domestic companies can seek “expedited relief from quantitative limits” for existing supply contracts. Second, since early September, rebuttals (responses to objections) and surrebuttals (responses to rebuttals) are allowed and the Commerce Department has facilitated tracking of requests through its website (www.commerce.gov/page/section-…). Third, parties are now permitted to submit confidential business information in support of requests or comments. These last two changes were implemented in response to significant criticism of the process from companies and Congress. At present, over 3,500 exclusions for steel and aluminum products have been granted (about 10 percent of posted requests). In all but a few cases, the exclusions that were granted had been unopposed. How Does a Company Take Advantage of a Product Exclusion? For product exclusions from the Section 232 measures, requestors must closely track the regulations.gov dockets (Steel 232 docket BIS-2018-0006 and Aluminum 232 docket BIS-2018-0002) for the status of requests. Once granted, an exclusion is valid for one year and is limited to the product description, quantity, supplier(s), and country(ies) of origin as defined in the request. After a decision is posted, the Commerce Department notifies CBP, but the importer of record is nevertheless required to inform CBP in advance of importation. More specific guidance on claiming an exclusion can be found at CSMS #18-000378. If an exclusion is granted, companies are eligible for a retroactive refund of Section 232 tariffs back to the date the request for exclusion was posted for public comment at regulations.gov. It is especially important to remember that, other than with respect to the first list of products covered by the Section 301 tariffs, U.S. stakeholders who believe a product should be excluded from the application of Section 232 or Section 301 tariffs may still be able to file an exclusion request.